For 40 days and nights since his platinum image was stained by football deflation allegations, Tom Brady has maintained his silence about the controversy, with one exception — a highly publicized appearance at Salem State University the night after he was implicated by the NFL’s Wells Report. It turns out Brady had a good reason, at least financially, to speak last month at Salem State. The university disclosed Tuesday that its nonprofit Salem State University Foundation paid the Patriots quarterback $170,000 to participate in its annual speaker series. University spokeswoman Karen Cady said Brady’s appearance was funded by proceeds from ticket sales and sponsorships. She said no public funds supported his engagement. Salem State’s foundation provides scholarships to students, helps recruit faculty from diverse and underrepresented backgrounds, enhances internships and other student experiences, and contributes to building projects, according to its website. Brady’s agent, Don Yee, declined to comment, citing the four-time Super Bowl winner’s interest in keeping his personal business private. The Patriots quarterback made his first public appearance since the release of the Wells Report on Wednesday. Salem State’s disclosure followed three public records requests made since last month by The Boston Globe. The school and foundation refused to comply with the first two requests, but the university responded after the third, which sought the payment amount contained in the records of school president Patricia Maguire Meservey. Meservey declined numerous requests to discuss Brady’s payment. But she issued a statement during the public records process in which she expressed support for the speaker series. The program was launched in 1982 and has hosted many distinguished figures, including former presidents Gerald Ford, Jimmy Carter, George H.W. Bush, and Bill Clinton. Numerous sports figures also have participated, including Patriots coach Bill Belichick last year. “I remain confident that over the past 33 years the series has been, and will continue to be, an important community enrichment program designed to inform, engage and encourage discussion within the community,’’ Meservey said. Cady said the university foundation made an estimated $40,000 from ticket sales and sponsorships for Brady’s appearance. She said the funds will go toward supporting the speaker series, which helps the university fulfill its public education mission. The foundation has raised about $20 million in total over the last five years and spent about $10 million to support the school, according to its federal tax filings. It maintains net assets of about $31 million. Every ticket for the Brady event was sold, and his appearance was delayed more than 30 minutes while throngs of ticket-holders, predominantly Brady supporters, were seated. The hourlong engagement began with Brady fielding a series of questions from television reporter Jim Gray about the allegations that the Patriots used deflated footballs during the team’s AFC Championship game win over the Indianapolis Colts. The day before Brady’s Salem State appearance, investigator Ted Wells, who was hired by the NFL, had issued a report saying it was “more probable than not” that Patriots personnel had deliberately deflated the game balls and that Brady was aware of it. Brady has yet to elaborate, as he awaits a hearing next Tuesday before NFL Commissioner Roger Goodell at which the quarterback will appeal his four-game suspension. Brady told Salem State officials he helicoptered to his appearance because of concerns about navigating traffic from Foxborough to the North Shore during the evening rush hour. Two weeks earlier, he cited a family priority rather than travel with the Patriots to the White House to be honored by President Obama. The weekend before the Wells Report was released, Brady chartered a private jet to travel to the Kentucky Derby and then to the championship boxing bout between Floyd Mayweather and Manny Pacquiao in Las Vegas. Brady’s estimated salary for the 2015-16 season is $7 million. He also receives millions for sponsoring consumer products. Brady’s speaking fee appears to have risen sharply since he won his fourth Super Bowl in January. As a three-time champion, he previously requested $75,000-$100,000 per speaking appearance, according to the website of Direct Sportslink, a sports celebrity booking agency. 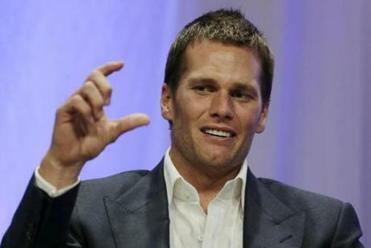 The Patriots quarterback is not alone in commanding large fees for college speaking appearances. Denver quarterback Peyton Manning, a one-time Super Bowl champion who has long ranked with Brady among the most marketable NFL players, last year received $105,000 to appear at Oklahoma State University’s speaker series, according to the Tulsa World. Tuition for Massachusetts residents who attend Salem State full time next year will be $9,246, plus housing and meal plans ranging from about $7,800 to $10,850. Several other public universities in Massachusetts were criticized earlier this month when the Globe reported they had paid $25,000 to $35,000 to celebrity commencement speakers. In addition, Westfield State and its former president Evan Dobelle have come under fire since a 2013 Globe series revealed Dobelle had extravagantly spent school funds, including more than $500,000 on two versions of a speaker series. Todd Wallack of the Globe staff contributed to this story. Bob Hohler can be reached at robert.hohler@globe.com.